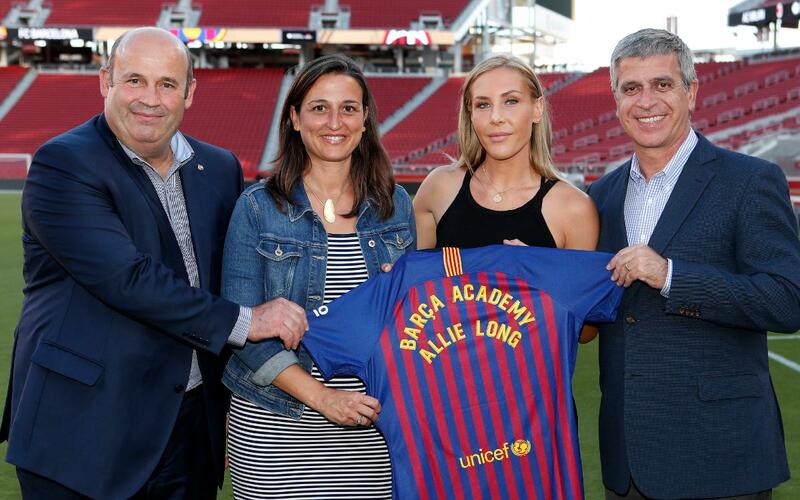 One of the best American soccer talents, Allie Long, has become the first professional athlete to collaborate as a technical advisor of Barca Academy Pro NY, on Long Island. The midfielder was born in Huntington, close to the site of the soccer academy, and has already been contributing her experience to the project for several weeks. The Seattle Reign player began her relationship with the Barca Academy Pro NY late last spring, when she became an ambassador and advisor for entrance trials for girl players, as well as playing an active role on both the Girls ID Clinic and at a camp held on school premises last July. For the remainder of the season, Allie Long will continue working with the academy as long as her club and US national team commitments allow. Her presence is already confirmed at the Girls Welcome Practice in the coming weeks, the opening ceremony of the academy's season, and at a specific clinic for girls this fall. Her presence with the Barca Academy Pro NY project is a major boost for the Long Island school. The students look up to Allie and work even harder to earn their spot on the team. They also see more clearly the possibility of pursuing the sport in college and perhaps professionally, if they have the skill and determination to make it. The Barca Academy Pro are soccer schools managed directly by FC Barcelona through its international offices. Today, the club has two Pro academies, one in Asia (Haikou, China) and one in North America (New York). The goal of these special academies is to participate in the biggest competitions in each geographical area, such as the New York Club Soccer League – National Premier League in the U.S. Together with the Barca Residency Academy USA, the Pro academies are the only schools with players wearing the official FC Barcelona jersey from the current season. The Barca Academy is FC Barcelona’s model for youth soccer development worldwide and its main objective is the multi-faceted education of its students. This model of a soccer school, exported internationally, aims to grow the Barca brand and transmit the work ethic and values of the Club around the world. The schools work with their own unique model based on the Barca methodology from the youth teams up to the first team, with an attacking and creative playing style and the transmission of crucial values such as respect, humility, effort, ambition and teamwork with considerable success. Currently, FC Barcelona has 45 Barca Academy projects around the world, 180 campuses and 50 clinics, with a presence in 52 countries and across five continents, and the participation of 45,000 children across all the activities. The Barca Academy projects are divided into the Barça Escola, naming used exclusivley for the school in Barcelona, the Barca Academy Pro in Haikou (China) and New York, the Barca Residency Academy USA in Casa Grande (Arizona) and the 41 Barca Academy spread across the five continents.